“Lost World” is like my bedroom: cold, damp, poorly lit. Oh, God! Do you think the Russians might be drilling into my bedroom? They probably want my natural resources! The thought of the Reds, bursting through my coal chute, snatching up my… clean socks, or something. Brr. It hardly bears thinking about. But, yes, I live in a basement. “Tiempos Finales” I call it, and it bears some striking similarities to the “lost world” I read an article about recently. There are a few key differences. The main difference, I suppose, is that the lost world the article describes is buried beneath about two miles of ice in Antarctica. Tiempos Finales is buried under 2 layers of wood flooring (and some linoleum in the bathroom) in St. Paul. Also, while a healthy person can survive almost indefinitely in the basement (assuming they have the proper protective equipment), you would suffocate, or freeze to death, or both, in Antarctica’s lost world, because it consists of sub-glacial lakes. And while Tiempos Finales is teeming with mysterious creatures (largely arthropods—there’s rarely more than one chordate present at a time), Antarctica’s lost world only may be teaming with mysterious creatures. But if there is anything down there, under the ice… it would be a very mysterious creature indeed. And that’s why the Russians are drilling away. Russians and Brits are both drilling, in fact, but not together. A team of British scientists intends to drop probes into Lake Ellsworth, which they believe to be about 300 feet deep with a bottom covered in thick sediment. The Russians are drilling into the much larger Lake Vostok. Both lakes (and about 150 others) were discovered relatively recently thanks to ice-penetrating radar. Cool. If any organisms are found, they’d likely be pretty different than anything else on the planet (remember my post a few weeks about aliens living among us? I knew you would. This is like that—isolated, extreme environments, etc). Also, the presence of life beneath the Antarctic ice would raise the odds that life could exist elsewhere in our solar system. Europa, one of the moons of Jupiter is the main analogy here. Europa is a frosty little moon (it’s a little bit smaller than our moon). Its surface is entirely covered with ice, but many scientists believe that a liquid water ocean could exist beneath the icy crust. The water could be kept liquid by heat generated by tidal and tectonic activity. 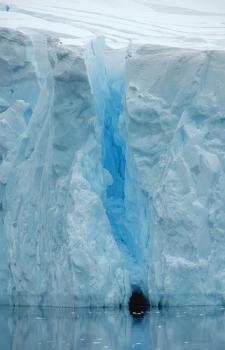 Organisms in the Antarctic lakes would be living under very similar conditions. With no light reaching that far into the ice, they would have to survive by consuming nutrients accumulated in the sediment millennia ago. Life on Europa might be nourished by heat and nutrients from mineral-rich hot water vents on the sea floor. The British scientists don’t expect to break through the glacier until the Antarctic summer of 2012-2013, and when they finally do they’ll have just 36 hours to drop their probes through the 14-inch hole before it seals up again. They plan to get two probes into Lake Ellsworth. The first probe will capture video, and sample the water for living organisms, or for chemical evidence of them, and it will grab some sediment from the surface of the lakebed. The second probe will be sunk deeper into the lakebed, and will hopefully bring back several feet of sediment. The Russians don’t plan on putting any probes into Lake Vostok—they just intend to tap into the lake to sample the water. The Russian project is somewhat controversial because their equipment is lubricated with kerosene, and is non-sterile (the British use a sterile, hot water-based drilling technique). There’s a good chance that the Russian equipment could contaminate the otherwise completely pristine lake, which, you know, slightly defeats the purpose. The Russians have had trouble with their equipment, however, and when they will break through the ice is much less certain. So what do y’all think? Are they going to find anything? If Ellsworth and Vostok are anything like Tiempos Finales, whatever they find will be pretty depressing. Still, this is pretty cool stuff. Not our moon, but Europa, a moon of Jupiter. Scientists are planning new missions to explore Europa, which they now believe contains a water-filled ocean, and possibly life. 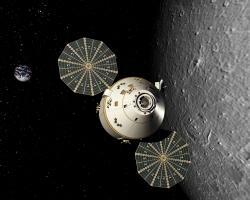 The Orion crew exploration vehicle: This rendering represents a concept of the Orion crew exploration vehicle. Image courtesy: Lockheed Martin Corp.Scientific American.com has a cool interactive on what they think the Five Goals for Exploring the Solar System should be. Check it out, and then think about what you think our goals for exploring the solar system should be. What do you think?